Photo Courtesy of Rick McOmber with Historicbridges.org The 140 year-old Hunterdon County Bridge is still in use thanks to a $340,000 TE award for its restoration. Farmers, traveling with horse drawn carts, used this bridge over the south branch of the Raritan River when they came to market to sell their goods and purchase supplies. Over the years the bridge fell into disrepair, trusses were bent or broken, bolt hangers, and the stone masonry began to deteriorate. Maintenance was done on an emergency basis or deferred; bridge inspectors noted the structure's historic significance while recommending that the whole structure be replaced. Due to the historic significance of the bridge and public support, the county opted to rehabilitate the bridge. Rehabilitating the bridge proved to be the best decision all around: it was less expensive than replacing the bridge, it would require less closure time and not affect bike, pedestrian, or canoe travel on the river below, and its historic elements made it eligible for TE funding. 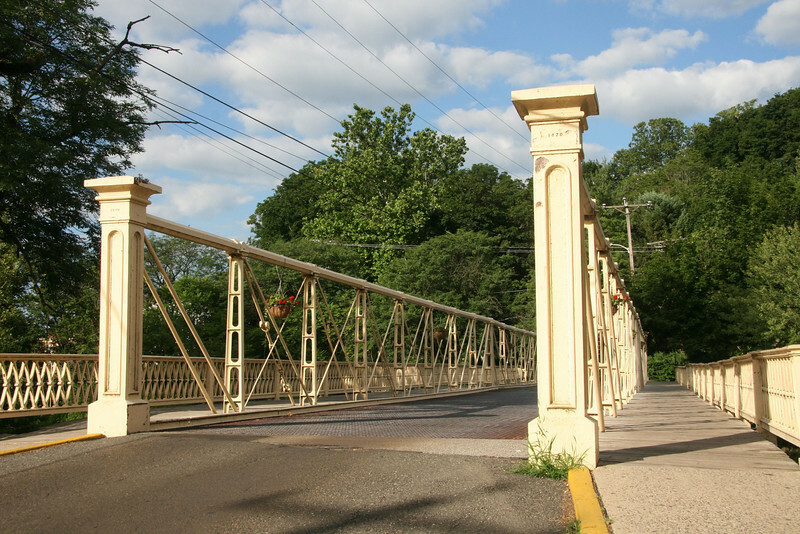 The restored Hunterdon County Bridge not only connects Main Street businesses with a historic mill and museum, but it also provides the community with a link to its past while they travel to their future.